Sometimes, a New England summer can come and go, and suddenly you realize: I never even set foot in the ocean or a pool! For many water-loving humans, this is a wakeup call that sends them jetting off to the Caribbean in the winter. But you don't have to go to the trouble and expense of flying to a warmer clime if you want to dive in and swim outdoors this winter. New England might not be your first thought for outdoor, year-round swimming, but if you're visiting during the winter months and want to swim outdoors without freezing your parts off at a Polar Bear Plunge, you actually have a few options. Here are a dozen hotels and resorts that offer year-round, heated outdoor pools. 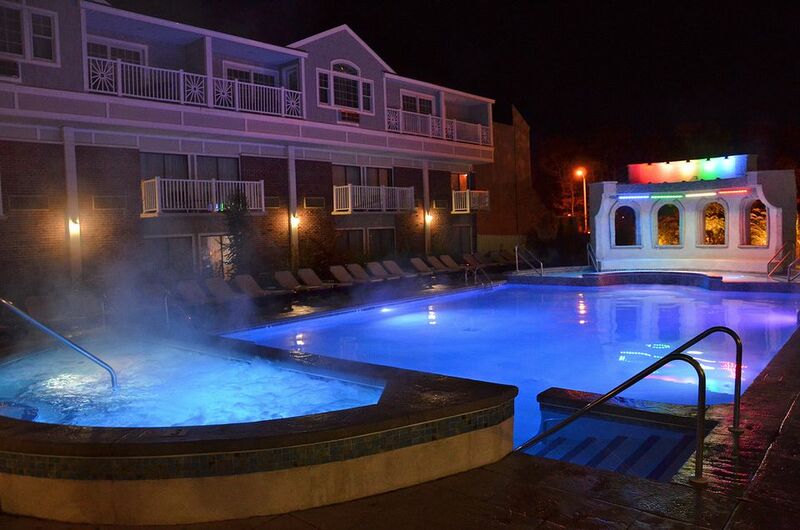 The family-friendly Cape Codder Resort & Spa in Hyannis, Massachusetts, offers New England's most colorful option: Their Rainbow Falls Saltwater Pool is heated and bathed in colorful LED lights at night year-round. On Fridays, Saturdays, and Sundays, at least one hour is reserved for adults only. On winter weekdays when kids are in school, grownups have a good shot at having this romantic pool all to themselves, too. In the Berkshires of western Massachusetts, book a stay at the classic Red Lion Inn in Stockbridge or the retro-cool Porches Inn at Mass MoCA in North Adams, and you'll also be able to defy the elements and take a dip in the frosty air. Both of these distinctive properties also have outdoor hot tubs that bubble and soothe all winter long. The Porches offers the ultimate flexibility: Its outdoor heated pool and whirlpool are open to guests 24 hours a day. After a long day of tackling the slopes at Newry, Maine's Sunday River, skiers love the muscle-soothing warmth of the heated outdoor pool and hot tub at the Grand Summit Hotel. In nearby Bethel, Maine, the Bethel Inn Resort also offers guests a year-round outdoor heated pool, which is kept at a toasty 90°F. Steam rises off the surface of the water in misty towers when the pool is ringed with feet of snow. Budget-conscious Maine travelers who want to be able to say they swam outside in a snowstorm should check in at the Best Western Merry Manor Inn in South Portland, where rooms can be booked for less than $100 this winter. The hotel's heated outdoor year-round pool is wonderfully designed so you can swim out from inside, where your towel and clothing will stay warm and dry. In North Conway, New Hampshire, you can swim outdoors all year long and enjoy fabulous views of the White Mountains. At the White Mountain Hotel and Resort, the year-round outdoor heated pool and Jacuzzi are inviting after a day of vigorous winter snow sports or outlet shopping. In Bartlett, New Hampshire, the Grand Summit Hotel at Attitash offers slopeside access to Attitash Mountain Resort plus the après ski enticement of outdoor hot tubs and a year-round outdoor pool. The outdoor heated pool at Indian Head Resort is lakeside, and winter guests at this century-old Lincoln, New Hampshire, retreat can catch snowflakes on their tongues while they practice the backstroke. In New Hampshire's Lakes Region, treat yourself to a getaway at Church Landing at Mill Falls at the Lake, and you'll love the two-in-one experience of swimming in the indoor-outdoor pool in any weather. Mist rises to greet those who dive into the heated outdoor pool at the Green Mountain Inn in Stowe, Vermont, on frigid days. And at Hawk Inn & Mountain Resort in Plymouth, Vermont, they practically invented the idea of swimming outdoors in the dead of winter. Hawk Inn debuted Vermont's first year-round, heated outdoor swimming pool in 1997, and guests will find it heated to a comfortable 90°F in the winter months. With views of the snow-capped Green Mountains, you'll feel as if you're submerged in a dream...until you have to brush the icicles out of your hair. Packing Tip: If you're staying at a New England hotel with a heated outdoor pool this winter, be sure to pack a cozy robe or cover-up to don when you step out of the water as well as footwear that is easy to slip on.